A 25-year old painter in Ojodu Berger area of Lagos, Friday Eyaman has been arrested by operatives of the Federal Special Anti-robbery Squad (FSARS) on Lagos Island, Lagos for allegedly selling the unregistered Ford Edge SUV entrusted in his care by a customer to repaint for him, to a police officer who posed as a buyer for N1.5m. 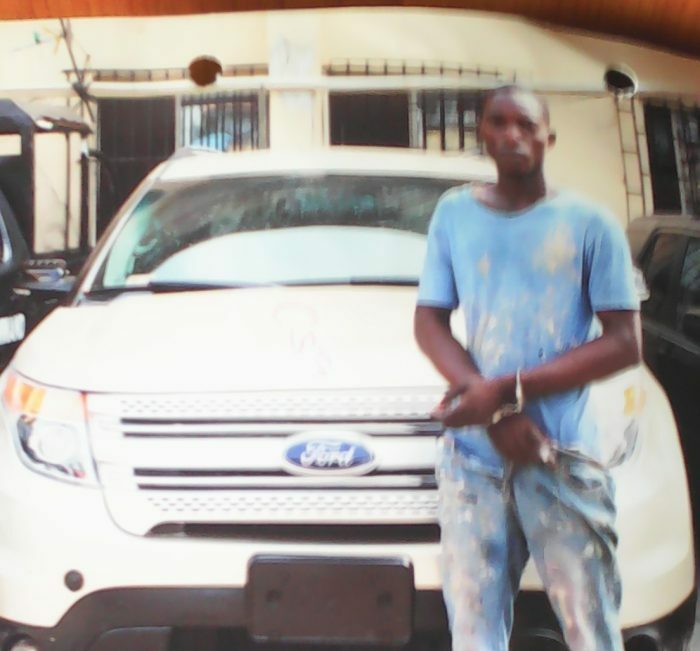 Deputy Commissioner of Police, DCP, in charge of FSARS, Lagos, Kola Kamaldeen who directed his team led by SP Olaniyi Festus to arrest the suspect following the intelligence report he received from a source that the painter was looking for a buyer for his customer’s SUV. According to a police source, trouble started for Eyaman in February, 2019 when DCP Kamaldeen received a tip-off from a source that Eyaman was looking for a buyer for his customer’s SUV. Following the report, Kamaldeen gave the suspect’s phone number the source provided for him to Olaniyi Festus and his team to contact the suspect and pose as a buyer of the SUV to enable them arrest him and recover the SUV from him before he disposed it at a give away price. Police alleged that a member of the police team later contacted the suspect to discuss the asking price of the SUV and the suspect allegedly told the caller that the price of the SUV was N1.5m and that if he was interested, he should come over to Orile bus stop, Lagos to inspect the SUV and pay for it, unknown to him that the person discussing with him about the SUV on phone was a police undercover agent. Following the discussion, the police team stormed Orile bus stop to mount positions ahead of the arrival of the suspect and as the suspect drove the SUV to the scene, the police agent after inspecting the SUV, told the suspect to drive him to a nearby bank to withdraw money to pay for the SUV and on the way, Festus and his team used their operational Vehicle to block the SUV and arrested the suspect and the alleged buyer and took them with the SUV to the station. A Police source said that it was at the station that the suspect realised that the supposed buyer of the SUV was a police officer. During investigation, according to the police, Eyaman allegedly confessed to the crime that he decided to sell his customer’s SUV to enable him raise money to perfect the bail conditions of his brother remanded in Kirikiri Prison, Apapa, Lagos for alleged manslaughter. Eyaman allegedly stated: “Problems started for me in February, 2019 when I went to visit my brother who was remanded in Kirikiri Prison, Apapa for alleged manslaughter and as I was about living, one of my brother’s inmate friend advised me to sell my customer’s SUV and use part of the proceeds to perfect the bail conditions of my brother to regain freedom and I agreed to sell my customer’s SUV. But I am still in shock on how the police got my phone number to call me for the SUV." A Police source disclose that the suspect would be charge to court after conclusion of investigations.